Bid2Share.com allows people to sell items they no longer want or need with the proceeds of the auctions going to the charity of their choice. By setting up Auctions to sell multiple Items – clothes, electronics, books, DVDs – people can support the causes they value. Through their use of Social Media to promote their Auctions, Sellers also publicise the Charity or Appeal. Sellers can get others behind their Bid2Share! Raising money through Bid2Share.com is a unique way for Sellers to support their chosen Charities or Appeals. All transactions between Sellers, Buyers and Donors take place online in a safe, secure environment. 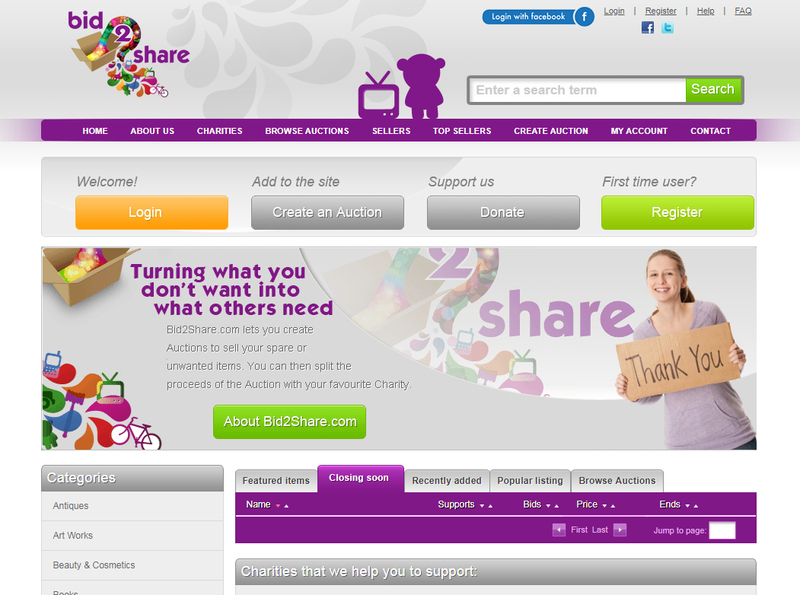 Bid2Share.com is a great opportunity for a charity to raise valuable funds with little effort.